I shoot a ton of engagement sessions, and because I travel quite a bit for them, I wanted to share my Top 10 favorite spots right now. This gem is definitely worth checking out, especially Cherry and Webb beach.The dunes and the beach grass provide a nice little shade, and the beach itself is very pretty. If you are looking for a little adventure, walk the cliff walk on your engagement shoot. At Ledge Road, you can access the cliffs, but there is no ‘legal’ parking right there. Gorgeous views from this area, to the right, the cliffs lead to a dirt walking path and down to Bailey’s beach. Another gorgeous area, with rocks on the beach. The main building of MIT provides an incredible backdrop for engagement photos. The back of this building faces the Charles River. There is a gorgeous view of the Boston skyline. What is not to love about the Back Bay neighborhood (aside from parking!). The brick sidewalks and gorgeous victorian brownstones all provide a beautiful city neighborhood feel. This lush park with an array of trees, shrubs, and flowers is one of my favorite ‘park style’ places to shoot. There are so many flowering trees and shrubs at different times of the year, a perfect place every time. Lettered Streets and cool neighborhoods. Lots of hills, Boston Harbor, and Thomas Park. I love the view from South Boston. I love this area so much, the boats, the city skyline… From the North End to the South End, the Harborwalk is one of my favorite places to be, with or without a camera! This place speaks for itself. The city does require a permit to shoot here, but it’s a gorgeous spot inside the city in Beacon Hill. Park at the summit for a few bucks and walk some of the paths just before sunset. Then at sunset, grab your lover for a few romantic photos on top of the world. All of these locations look so beautiful! I especially love the first two beach locations 🙂 I think that there’s nothing better than to enjoy a sunset session at the beach! Beautiful pictures and good recommendations. 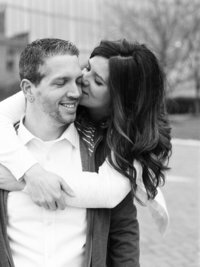 This is so great for couples who are still searching for a great spot for a session! What beautiful engagement locations! I can definitely see why you love photographing there.